Sperm Whale Tooth"Tow Over the Columbia River Bars"
This is a guaranteed real Sperm Whale tooth that is registered with the Department of commerce as number 21-0003. It weighs 290.7grams. This, of course, is a Sperm Whale's tooth signed by M.M. Cohen. It's etched all the way around. Shown on the front is a three-masted gaff-rigged schooner. It's being towed by a Columbia River tugboat, which is shown on the back. It is very finely etched, and has a light wash of color. The tooth is 5 1/4 inches long and 2 1/4 inches wide. This tooth will be a wonderful addition to your scrimshaw collection! A unique piece - Only one available. Please bookmark our site. We add new designs every month. Please note, our whale's teeth and walrus tusks may be sent anywhere within the 50 United States. We Use No Contemporary Ivories of Any Kind. A scrimshawed Sperm Whale's tooth has long been prized as the ultimate American heirloom gift. There is a very limited supply of legal teeth, and this supply is diminishing rapidly. We have a number of unetched Sperm Whales' Teeth available for commission that await your ideas. We can scrimshaw any design, including your own boat, or any class boat, power or sail. 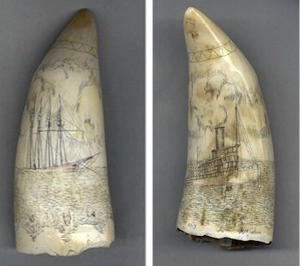 (Scrimshawed Sperm Whale teeth make magnificent nautical trophies.) We would be happy to add your name and the name of the boat as well. We also have legal pre-1972 Walrus Tusks available for commission. We will scrimshaw or carve practically any design, animals, nature, etc. - And, we also make cribbage boards to order! Simply email us to start a dialogue, or snailmail us your request and we will return commission prices and pictures of raw teeth and tusks that are available for commission. Don't see exactly what you want? We also do commission pieces. Need a really special holiday or other gift? From jewelry, knives, fountain pens, corkscrews, pistol grips, pens and pencils, desk accessories to whole Sperm Whale Teeth - We will handcraft and even personalize any piece with a scrimshawed name, initials or design of your choice. (Our website is not large enough to show all of the different pieces we make to order!) Just email us at studio@ancientivories.com and let us know your needs!